At Providence Realty Partners, we proudly serve and represent our valued Customers in the buying and selling of Real Estate in Charlotte, Lake Norman, Asheville, the Foothills and the Blue Ridge Mountains, in addition to Raleigh - Durham, North Carolina. Our beautiful city of Charlotte was founded in 1768, and named after the wife of England’s King George III. Mecklenburg, the name of its county, originates from Queen Charlotte’s German heritage. Charlotte is home to the Carolina Panther’s football team, the Hornets basketball team, the Knights baseball team, and the Checkers hockey team, and the Charlotte Independence Soccer team. Uptown Charlotte, our “downtown,” hosts many of these teams and from any area neighborhood, is a quick and easy drive. Charlotte is a growing metropolis, as the city is consistently rated one of the fastest growing cities and one of the best places to live in the United States. Charlotte is also the second largest Banking city in the United States, second only the New York City. With more than 300 Fortune 500 corporations, Financial Institutions, and countless international corporations, the population of our city continues to grow and attract diversity, making Charlotte such a special and unique place to live. 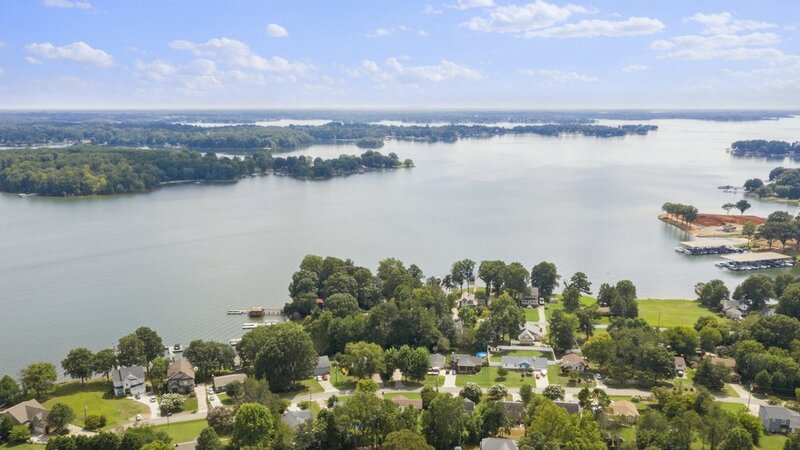 In just a quick 20 minute drive North of Charlotte, you can live by and enjoy the largest manmade lake in North Carolina, Lake Norman. Lake Norman was named after the former President of Duke Power, Norman Atwater Cocke and was created in 1963. Lake Norman boasts over 520 miles of shoreline and a surface area of over 50 square miles. With fantastic restaurants located on the shoreline of the Lake, islands to explore throughout, great marinas, and so many areas to explore by boat, wakeboard, stand up paddle board, and more, it’s no surprise that “Lake life” is lived at its finest by living on or near Lake Norman. There are also wonderful communities and golf courses for all to enjoy. Come and see why so many people are moving to this place of “permanent vacation mode” and loving living on Lake Norman. A quick 90 minute drive from Lake Norman will bring you to the Blue Ridge Mountains and Asheville. Asheville is the city where the most United States Presidents have visited, Billy Graham lived (just outside), and people from all over the world have chosen to visit to enjoy the extreme elevations, stunning views, national forests, outstanding landmarks and hotels, and incredible displays of the Fall "leaf season” where the colors will take your breath away. In fact, Asheville has the longest Fall foliage season in the United States. Asheville is not only fun and diverse with countless breweries to visit, but it boasts the River Arts District, and the world famous, Biltmore Estate and the Grove Park Inn. The Biltmore Estate is the largest private residence of 178,926 square feet in the United States built between 1889 and 1895 by George Washington Vanderbilt II. The “house” and the grounds are outstanding experiences for all to enjoy, along with staying at the hotels on the grounds and enjoying the restaurants and shops of Antler Village. The Grove Park Inn was built in 1913 and have hosted more United States President and their families than any other hotel in the country. Many famous writers like, F. Scott Fitzgerald lived there during summer months, along with visits from Henry Ford and Thomas Edison. The hotel’s spa is valued at over 100 million dollars and the restaurants are second to none. This jewel is an outstanding hotel to enjoy with sweeping views of Asheville and the Blue Ridge Mountains. The Capital city of Raleigh was founded in 1792 and named after Sir Walter Raleigh, the famous explorer and nobleman who was responsible for funding the first expeditions to the coast of North Carolina. Today, the Capital of North Carolina is home to the North Carolina State Legislature and Supreme Court. It also celebrated its bicentennial in 1992. Raleigh boasts some of the greatest collections of art and history in its museums, and is a short 2.5 hour drive from Charlotte. In 1701, explorer John Lawson called, Durham, “the flower of the Carolinas” for its beauty and foliage. In the 1800s, the city was named for Dr. Bartlett Durham, a physician, entrepreneur and land owner who donated the land that is now the city of Durham. Today, the city of Durham boasts the world’s largest university-related research park and is called, the Research Triangle Park. More Scientists from the Research Triangle Park have won Nobel Prizes that anywhere else in the world. Some of the most beloved universities, Duke University and the University of Chapel Hill (located in nearby Chapel Hill, North Carolina) are also located in the area and have benefitted the world through their important research. We’re here to partner with you. Would you like more information, or are you ready to start looking at homes? Send a note quickly using our easy form and one of our awesome Partners will gladly contact you! Copyright 2019 Providence Realty Partners, LLC. Disclaimer: To buy or sell Real Estate with Providence Realty Partners, LLC, the North Carolina Real Estate Commission requests that you review the "Working with Real Estate Agents" Brochure.